Brian McLaren is an influential Post Modern thinker in Christian circles. For that reason alone, his latest book A New Kind of Christianity, deserves probing and analysis for its impact on biblical truth and the centrality of Jesus to his arguments. Brian McLaren has recently published his most definitive work to date in which he comes closer than ever before to clearly stating what he believes. The book is subtitled, ‘Ten questions that are transforming the faith’ and the book is structured around two sets of five of these questions. He doesn’t state that the design is intended to contrast with the Ten Commandments, but the connection seems obvious – ten commandments on two tablets versus ten questions in two ‘books’. Brian states that the first book contains the ‘profound and critical questions that are being raised by followers of Christ around the world.’ (Pg. xi). The second set of five are, according to Brian, ‘less profound or theologically radical’ (Pg. xi) and are more practical in nature. I will deal with each of the ten questions, but first a couple of general comments.…read more for full review. Brian D. McLaren is an author, speaker, activist, pastor and proponent of postmodern thinking in today’s church. Time Magazine listed him as one of the twenty-five most influential Evangelicals in America in 2004. Brian has written a number of books including The Church on the Other Side: Doing Ministry in the Postmodern Matrix, (Zondervan, 1998, rev. ed. 2000) Finding Faith (Zondervan, 1999) and A New Kind of Christian (Jossey-Bass, 2001) which explores issues of Christian faith and postmodernity. 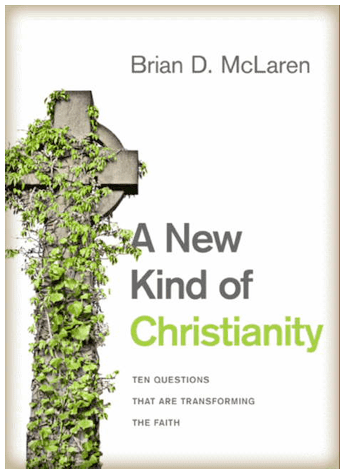 His latest book A New Kind of Christianity: Ten Questions that are transforming the Faith (HarperOne 2010) has drawn considerable response from the Christian community around the world. For more information go to Brian McLaren’s website at www.brianmclaren.net.